For directions to the Learning Games Lab on GPS or Maps, search for Gerald Thomas Hall, or 900 E. College Ave, Las Cruces, NM 88003. We’re on the corner of Knox Dr. and College Dr. Here's a map. 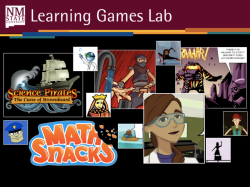 The Learning Games Lab is hosting three sessions for middle schoolers and one session for high schoolers during Summer 2019. Games Lab consultants will participate in game design and multimedia activities, play games in development and give our developers feedback to improve design. Youth should sign up for a session that corresponds to the grade they will be entering in Fall 2019. Consultants will participate in only one of the sessions. All interested consultants should sign up; no previous Learning Games Lab experience required. This sessions will occur at the Learning Games Lab. In order to be considered for participation, please complete the short form at the link below. Selection is based in part on research needs and on the potential of the applicants to contribute to our research. Therefore, all submitted applicants may not be able to participate in the session. If you are an individual with a disability and need an auxiliary aid or service please contact Amanda Armstrong at 575-646-1076 as soon as possible, at least one week prior to start of session.